I think you have to put Saban at 1. Everything he has accomplished has come at a time with much more regulation and rules than Bryant had to deal with. I'm not sure about this line of reasoning. I know a lot of people think this way but, is it valid? Many will say that coaches today are better because they have to compete against much better competition. They are better because the players today are bigger and stronger and faster. On the other hand, aren't all teams and players and sizes and speed relative to the time period they were in? Everything was equal back then, in most cases, as they are today. For example, Darryl Royal and John McCay and Bo Schembechler, etc... had all the same advantages that Bryant had. Isn't a Chihuahua in a death match with another Chihuahua just as trying, dangerous, and hard as two Pit Bulls fighting each other? Wasn't it just as hard for Bryant to beat teams that were evenly matched, even though not as talented as today's teams, as it is for Saban to beat team's today, even though they are better teams? Two ants fighting one another is just as dangerous as two elephants fighting each other, for the individual combatants. Saban deals with more regulation than Bryant did but, so do all modern day coaches. Bryant's contemporaries had the same amount of free reign as Bryant himself did. Doesn't it all equal out? It's not so much that the competition is better now...there's just more of it. In the seventies, realistically, on any given Saturday, how many teams in the SEC could beat Alabama? From 2007 to today, Saban has lost to 8 different SEC teams...a total of 14 games. A 9th team, Tennessee, had Saban beat once, only to have the FG blocked at the end of the game. He's also had to play one more regular season game, along with an SEC championship game. Bryant, from 1970 to the end of his career, only lost to 6 SEC teams...a total of 11 games. Two of Saban's losses came from teams that Bryant didn't have to worry about in his day, South Carolina and Texas A&M. There weren't 8 or 9 teams in the SEC that in any given year could beat Bryant. So yeah, in that respect, the competition is tougher for Saban. You can also take into consideration the fact that, in today's format, Bryant would get no credit for a national championship in 1973.
recruiting is more difficult for saban than bryant, imo. but the coolest part of all this is, both coaches had ncaa rules made because of them. Was 2-8 in Rose Bowls and never won a NC. He doesn't belong in the discussion with Royal, McKay, Bryant, Saban, etc. Coach Bryant had no qualms about playing home and homes with other national powers like USC, Nebraska, and Penn State. 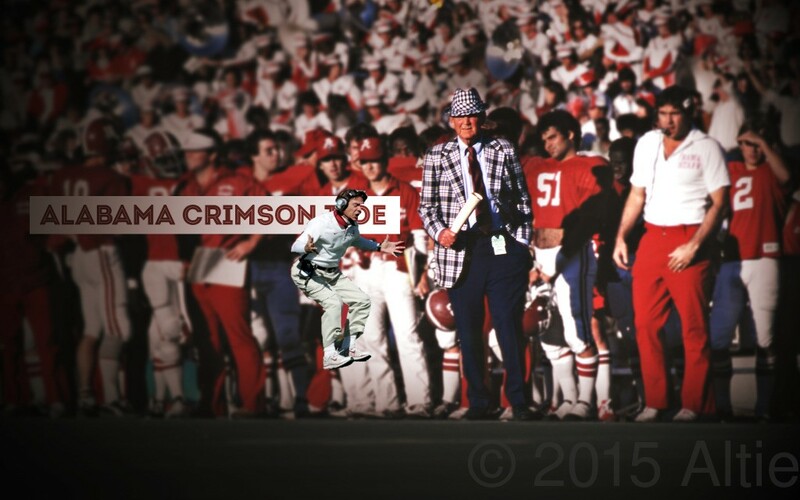 IMHO, Coach Bryant did as much as CNS did but with less talent. He didn’t have 5 stars 3 deep at every position. CNS is definitely the better recruiter, CPB the better motivator. As far as strategist, I think it’s pretty close but I’d give the edge to Bear. Most of his assistants loved him and stayed with him longer giving him more continuity. Yes he would but the last 10 would be kids he’d sign just to keep them off somebody else’s roster. Yes, and it's not really close.